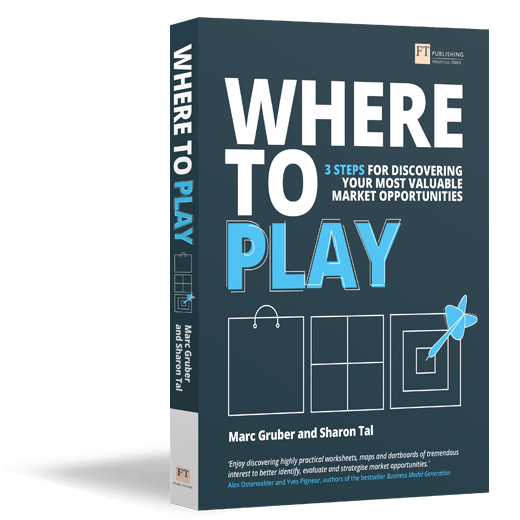 Where to Play teaches you how to systematically identify, evaluate and strategise your market opportunities. It’s a practical business book for anyone striving to commercialize new innovations. Learn how to apply the Market Opportunity Navigator with detailed exercises and case studies, to make sure that you are running in the right direction. Identify all your best market opportunities and start designing a focused and agile business plan and strategy. Designed to work seamlessly with our Business Model and Value Proposition Canvases, the Market Opportunity Navigator, proposed by Marc and Sharon, will help entrepreneurs and innovators to commercialize technologies. You will enjoy discovering highly practical worksheets, maps and dartboards of tremendous interest if you want to better identify, evaluate and strategize market opportunities. Let yourself be charmed by the toolkit and the case studies, along with the thoughts of Marc and Sharon. When two internationally-known experts in entrepreneurship write a “how to” book on market opportunities for entrepreneurs, it is bound to be a very valuable book indeed. Marc Gruber and Sharon Tal have created just the right book for first-time and experienced entrepreneurs. It contains both step-by-step plans and very valuable tips on identifying market opportunities – an invaluable complement to both the Lean Start-up Process and the Business Model Canvas! From entrepreneurship thought leaders comes this innovative step-by-step guide to thinking through the market essentials of an opportunity. Rather than relying on generic examples or others’ stories, the authors put the reader in the “driver’s seat” by encouraging him or her to generate, evaluate, and prepare to act on their own opportunities. I can’t think of a more practically useful entrepreneurship book. Henry Chesbrough, UC Berkeley Haas School of Business professor, and author of Open Innovation. Using thoughtful research and compelling examples, Where to Play provides important guidance on how to balance focus and flexibility when launching a new venture. It builds on the Lean Startup model by providing meaningful insights on what markets to address first. The market opportunity navigator attacks head-on one of the most difficult questions any aspiring entrepreneur must answer: ‘Which target market should I serve?’ It’s visual, easy-to-apply, and full of common-sense. If I were starting a business today, I wouldn’t leave the starting blocks without it! Use this book as you progress from identifying many possible business opportunities to recognizing patterns and distinctions among your options and to finally designing a successful strategy. Download the entire 1st chapter for free! By downloading the 1st chapter, you agree to receive updates from Where to Play.